After five months of firing off letters, emails and a petition to the university administration, the staff at Concordia’s Café X has finally acquired the little grey compost bin they have long been asking for. “I was so excited,” said the café’s manager, Laura Hudspith, upon hearing the news that the petition requesting a compost bin was successful. 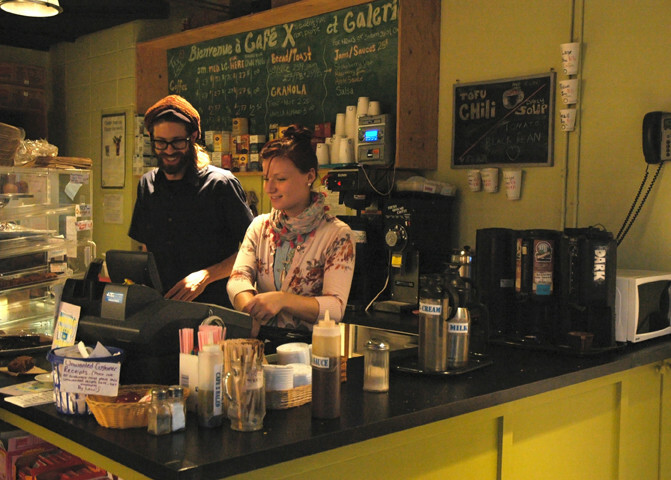 According to Hudspith, customers and staff have been complaining about the lack of a compost bin at the student-run, not-for-profit café and gallery space, which has been a fixture in the VA Building for over two decades. “All our utensils, cups and plates are biodegradable—and they’re expensive because they’re biodegradable. So we and our customers really wanted compost,” she said. Last year, Café X acquired a compost bin for its secondary location in the EV Building. “Everyone would always say, ‘You have one over at the EV; why don’t you have one here?’ And I’d just say, ‘I know, I’m trying. I’m really trying,’” Hudspith said. Last summer, she approached the Fine Arts department, Sustainable Concordia and the Fine Arts Student Alliance requesting a compost bin in Café X, but they all eventually turned down her request. Since she began posting copies of the petition in the café, the Fine Arts library, the arts supply store and other parts of campus, it has garnered over 600 signatures. Hudspith praised Ana Cappelluto, the Fine Arts associate dean of planning and academic facilities, for her help in the matter.